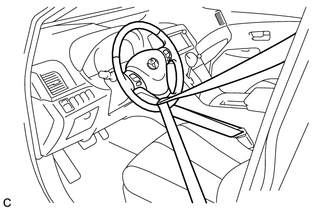 (a) Secure the steering wheel with the seat belt in order to prevent it from rotating. This operation is necessary to prevent damage to the spiral cable. (a) Remove the bolt and slide the steering intermediate shaft assembly. 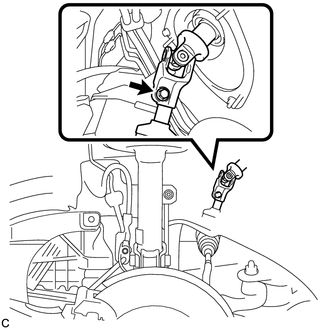 Do not separate the steering intermediate shaft assembly from the steering link assembly. (b) Put matchmarks on the steering intermediate shaft assembly and steering link assembly. 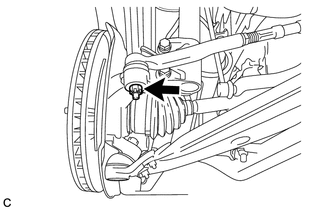 (c) Separate the steering intermediate shaft assembly from the steering link assembly. 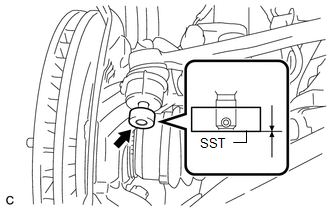 (b) Install SST to the tie rod end. 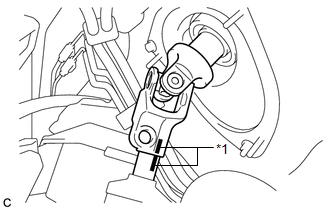 Make sure that the upper ends of the tie rod end and SST are aligned. 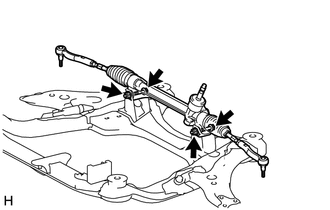 (c) Using SST, separate the tie rod end from the steering knuckle. Tie the string without allowing for any slack. Apply grease to the threads and end of the SST bolt. When securing SST to the steering knuckle, be sure to tighten SST using a string to prevent it from falling. Install SST so that A and B are parallel. 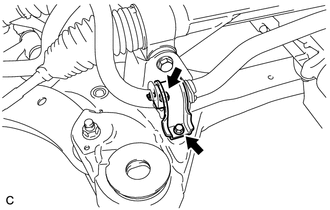 Be sure to place a wrench on the part indicated in the illustration. Do not damage the front disc brake dust cover. Do not damage the ball joint dust cover. Do not damage the steering knuckle. 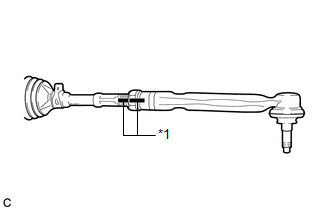 (a) Remove the 2 bolts and separate the front No. 1 stabilizer bracket LH. (a) Remove the front stabilizer bar with bracket from the front frame assembly. (a) Remove the 2 bolts, 2 nuts and steering link assembly. Because the nut has its own stopper, do not turn the nut. Loosen the bolt with the nut secured. (a) Put matchmarks on the tie rod assembly LH and steering rack end sub-assembly. (b) Loosen the lock nut, and remove the tie rod assembly LH and lock nut.